By his own admission, the author is no intellectual, yet neither is he a fantasist and what he reports has the ring of authenticity. He offers us the chance to create a better life for ourselves and he does this by discussing his approach to positive mental attitude and the idea that whatever we get out of life depends on what we’ve put into it. He takes the view that many of us consistently undervalue our own potential. But more dramatically he illustrates his theme, encouraging us to learn from his mistakes. He shares his own experiences and that of others he knows – real life stories that keep one’s attention. Wetton tells us something of his younger days – excessive alcohol consumption, womanising, and sometimes violence. Someone who hated all the numerous jobs he tried. Spiritually speaking he was lost. But he eventually found a path. One job he had involved driving around in a little van visiting customers on a door-to-door basis selling stuff and collecting weekly payments. One particular day he was running late rushing away from a house call when he got back into his van that was parked on the driveway. He slipped the gear into neutral, rechecked both wing mirrors, and even turned completely round in his seat looking through the rear window thinking he was wasting valuable time. For some unaccountable reason he switched off the engine and got out to find a small child sitting very quietly just inches from the rear bumper happily playing with a toy and completely oblivious to any danger. It transpired she had come from an adjoining garden. However, no summary by me can do justice to this or any of the string of personal anecdotes that have to be read in full before the credibility of what they reveal can be grasped. The reader is not asked to accept that a strange spiritual power definitely exists but only the possibility that it might do so. For it is understandable that many people might tend to believe instead that things just happen by chance and because of natural causes. However, I would suggest that those who cannot put to one side an attitude of cynical disbelief, will not like this book. 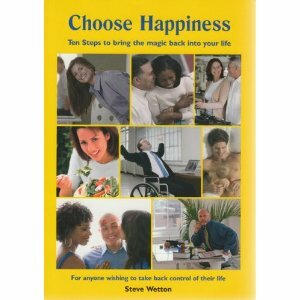 Choose Happiness is drawn with a light touch and makes for easy reading. For me it does what it claims and brings a touch of magic to the meaning of life. Next Next post: Hope for humanity?